Radical changes to tram safety are set to implemented in the wake of an investigation into the fatal Croydon crash, which has recommended more 'active' intervention to prevent human error. The Rail Accident Investigation Branch (RAIB) has suggested automatic braking systems could be used to prevent speeding and recommended research into how to monitor drowsiness in drivers and intervene if they start falling asleep. 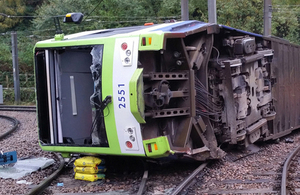 The news follows revelations that Croydon tram drivers have admitted to falling asleep at the controls. Seven people died and a further 51 were taken to hospital in the accident near Sandilands Junction in the early morning of 9 November 2016. An earlier interim report from RAIB gave a basic explanation of events, which suggested that the driver had lost awareness as he was approaching a bend and braked too late. It also cited poorly placed signage for drivers as an issue. In a statement, Mike Brown MVO, London's Transport Commissioner, said: `Since the incident we have introduced a number of additional safety measures to the tram network, including additional speed restrictions, enhanced speed monitoring, new signage for drivers and an upgrade of the CCTV recording system. `An in-cab vigilance system is being trialed and should be fitted to all trams by the autumn. Any sign of driver distraction or fatigue will result in the driver being alerted immediately. Work on an alert system for monitoring and managing tram speed is underway. The RAIB said that in addition, its investigation into how operator Tram Operations Ltd manages fatigue risk may result in a recommendation. RAIB said it had written to Transport for London which owns the tramway, Tram Operations Limited and UKTram, the trade organisation covering all UK tram operators, to formally confirm the areas that a number of its key recommendations are expected to cover.